Ignacy Hryniewiecki (Russian: Игнатий Иоахимович Гриневицкий; Ignaty Ioakhimovich Grinevitsky; 1856 – 13 March 1881) (Party name: Kotik, Russian for "Kitten") was a member of the People's Will and the principal assassin of Tsar Alexander II of Russia. Hryniewiecki was born 1856 into a Polish szlachta (noble) family in Kalinovka, a village in the Klichev district, in present-day Belarus. 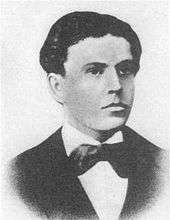 In 1875 Hryniewiecki left for Saint Petersburg, where he enrolled in mathematics at the Polytechnic. Soon he joined the Russian revolutionary Narodnaya Volya (People's Will) movement. In 1880 Hryniewiecki, Andrei Zhelyabov, Sophia Perovskaya and others were in charge of revolutionary propaganda among students and workers. Hryniewiecki was an organizer of the Workers' Gazette and a typesetter at a clandestine printing establishment. In February 1881 Hryniewiecki joined the bomb-throwing unit created to assassinate Tsar Alexander II. On 13 March 1881, (1 March O.S.) Alexander II was traveling in a two-seater carriage. An armed Cossack sat next to the coach-driver with Alexander II in the carriage while six other Cossacks followed on horseback. As the carriage approached a street corner near the Catherine Canal, Sophia Perovskaya gave the signal to Nikolai Rysakov and Timofei Mikhailov to throw their bombs. The Tsar was unharmed but two were wounded. Alexander II insisted upon leaving the carriage to check on the wounded. At this point Hryniewiecki who was leaning against the railing by the canal fence, raised both arms and threw his bomb and the blast tore the Tsar apart. Just before throwing the bomb he was alleged to have shouted "It is too soon to thank God", in response to the emperor saying "thank God I'm untouched" to the anxious inquires of his entourage. Nearby, Hryniewiecki himself lay unconscious from the blast. Hryniewiecki was taken to the infirmary attached to the Winter Palace. At 9 PM he regained consciousness, refusing to give any information to the police, he died from his wounds at 10:30 PM. The assassination had been meant to ignite revolution. Hryniewiecki's fellow-conspirators — Nikolai Kibalchich, Sophia Perovskaya, Nikolai Rysakov, Timofei Mikhailov, Andrei Zhelyabov — were sentenced to death and were hanged on 3 April 1881. They were buried in an anonymous common grave. The Church of the Savior on Spilled Blood was erected on the site of the assassination. 1 2 3 4 5 6 Yarmolinsky, Avrahm. Road to Revolution: A Century of Russian Radicalism. 1 2 3 4 5 "Alexander II". Spartacus Educational. Retrieved 25 August 2013.